You guys, it’s amazing what some time off does for a full-time mama. As a stay-at-home-mom of a child with special medical needs, there are no weekends. There are no evenings off. There is no break-time. And when there is no end in sight to all the doctors appointments, therapy, and treatments, it gets pretty overwhelming. I needed this break. So. Bad. We enjoyed a relaxing dinner at a “foodie” restaurant. We went out to the bar! I slept in until 10:00 and woke up when I wanted to, not when Jax wanted to! We had a long, delicious breakfast on the patio, complete with bloody mary’s. We topped it all off with a fun ride on the pontoon and a glorious sunburn. It was amazing and I feel so much better. I’m ready to jump in again – and good thing, too. We’re moving forward full-steam ahead with a plan for managing Jax’s Chronic Lung Disease. I love, love, love Jax’s new pulmonologist. I am so happy we made the switch. Dr. Maynard is an absolute perfect fit for Jax. 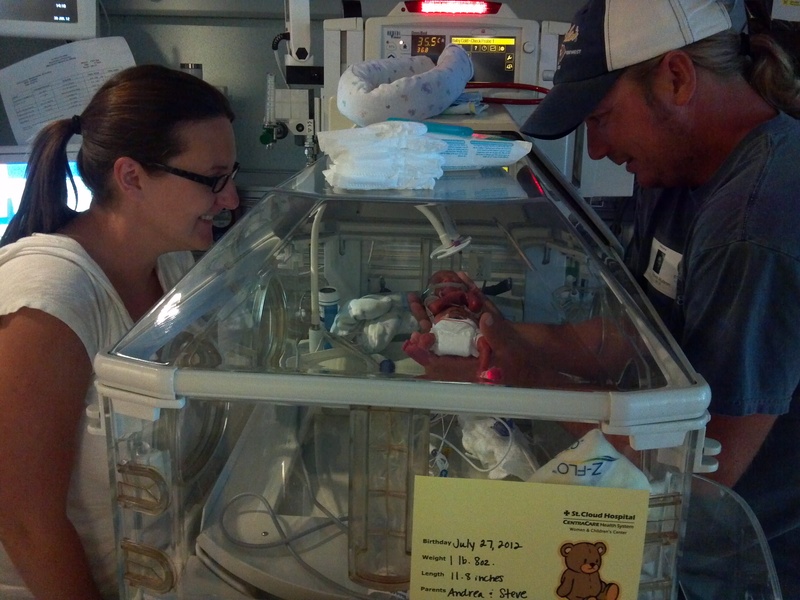 He was a neonatalogist in the NICU for 20 years and is dual certified in neonatalogy and pulmonology. He specializes in chronic lung disease in premature infants. Our appointment on Friday was the most thorough check-up Jax has ever had. (Even including when he was in the hospital. Seriously.) The doctor was with us for 2 hours. He asked every imaginable back-ground question. He examined Jax from head to toe. He answered all of my questions. He worked with his nurse to create a Respiratory Control Plan. The Respiratory Control Plan is by far the best thing that came out of the appointment. Since Jax started showing symptoms, I have been trying to get an action plan. In other words, what should I do and when? When I would ask, they would say “Well, when he’s having trouble breathing, you should bring him in.” Umm….Jax always has trouble breathing (i.e. wheezing, coughing)! So, that answer did not do us any good. There are three zones: Green, Yellow, and Red. Green means Jax is breathing normally. Yellow means he has symptoms such as a cough or wheezing. Red means he is having significant trouble breathing. Each zone has specific things to look for. And specific action items for each zone, including a list of which medications to give and when. Green zone meds include his twice daily inhaled steroid nebulizer. This is what he has to take everyday, even if he is well. Yellow zone meds include rescue medications. He’s on Albuterol 4 times a day and Duoneb (a “suped-up” neb) twice a day. Jax is in the yellow zone now (and has been for almost two months). He is on the verge of being in the Red Zone. (If he does not get any better in the next 24 hours, he will be elevated to the Red Zone.) I hope that our Respiratory Control Plan can help him stay out of the red zone for ever, but if it doesn’t, at least I know what to do! Jax will also be evaluated by an ENT surgeon next week. The surgeon will most likely want to do a bronchoscopy where he will examine Jax’s airways for scar tissue or “floppy airway,” which could also be part of the problem. This is a good step in the right direct for finding some answers about why Jax is having such a hard time breathing and why he is having such a hard time eating textured foods. One thing I have learned is that unless you have been there, you really don’t have a clue what people are going through. Steven and Andrea, you are doing an amazing job of caring for Jax, juggling dr appointments, trying new medicines, gathering information and through all of this, you are keeping it all together. Jax is a lucky little boy to have you as parents. I am so happy you got away. Everyone needs that. I seriously thought Steve would do the post toda….LOL! I think Steve needs a vacation from my vacation now! 🙂 He did a great job – I am lucky to have him.